A set of disappearing glass lungs. Clear glass fingers that reach out from a computer screen to touch the keys of a modified laptop. A mysterious glow emanating from a grove of trees. What will sculptor Julia Chamberlain dare to do next? Despite her intriguing creations as a sculpture student in the School of Art + Art History + Design, Julia never intended to pursue a fine arts degree. Arriving on campus in the aftermath of the 2008 economic meltdown, she plotted a more practical course: a bachelor’s in Human Centered Design & Engineering. Lois Rathvon can count 10 family members who’ve graduated from the UW since 1915, and that’s just on her late husband Hal’s, ’43, side. Deeply appreciative of the University’s positive influence in their lives, her son Will, ’76, recently created the P. Rathvon Family Legacy Scholarship to support liberal arts students. Lois first embraced the arts as a 12-year-old, when she began tap lessons during the Great Depression. Her first teachers? Artists hired by the federal government. She eventually went on to chair Cornish College of the Arts’ dance department. “We hope this scholarship helps gifted, emerging young artists to find their creative voices,” says Lois. Containing everything from ceramics and metal fabrication facilities to a glass casting shop, the CMA is the beloved home base for students in the school’s 3D4M (Three-Dimensional Forum) program. Instantly welcomed by the CMA community, Julia was hooked. She embarked on a second degree in sculpture on top of her engineering studies. It was a big decision, requiring an extra commitment of time and money to take on a fifth year as a UW undergrad. Julia earned some timely support for her bold move last year: the School of Art’s P. Rathvon Family Legacy Scholarship. Four generations of Rathvons have attended the UW, and Will Rathvon, ’76, created the award to ensure that the University continues to transform others’ lives. The scholarship fueled her studies in the intimate, intense atmosphere of the CMA. 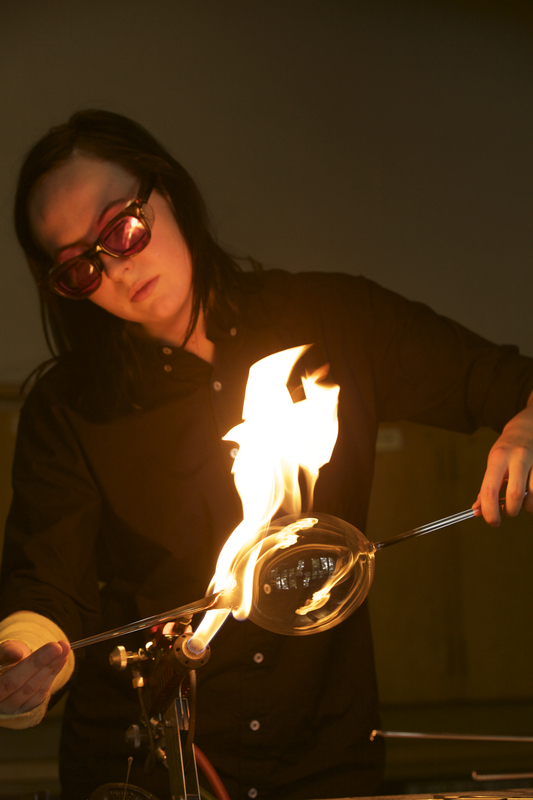 When professor Mark Zirpel challenged his flameworking class to “make a system” with an input and an output, Julia devised an ingenious set of seemingly invisible glass lungs that materialize only when an observer breathes into them. The piece led to another honor: the 2014 Outstanding Student Achievement in Contemporary Sculpture Award from the International Sculpture Center in Hamilton, New Jersey. Julia is the only UW undergrad in living memory to snag the prestigious award. The momentum continued this fall when the 23-year-old exhibited in Mad Campus, an installation of 12 large-scale public artworks spread around the UW campus. The youngest artist in the invitation-only show, she transformed a grove of trees into an enigmatic space that glowed with an eerie white light each night. After a residency in Bergen, Norway, Julia will complete her engineering degree next year, and then it’s on to advanced studies in industrial design.